Ahead of President Donald Trump’s trip overseas, several reports suggested that he was considering replacing Spicer at the podium or reducing his on-camera role. Other allies of Fox News anchor Kimberly Guilfoyle fueled reports that Trump was considering her for the job, rumors that she was willing to confirm. 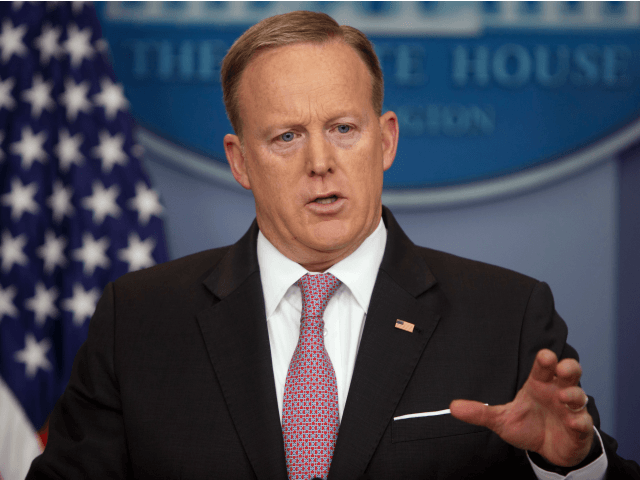 Spicer spent a few days working at the Pentagon as the rumors circulated, as part of his U.S. Navy Reserve duty. Deputy press secretary, Sarah Sanders, filled in, prompting rave reviews from the media and feeding more rumors that Spicer would be replaced. Trump did not bring Sean Spicer into a close circle of advisers whom he took to meet Pope Francis during his trip to Rome, prompting sympathy from even the most jaded reporters who spend most of their day mocking his role in the White House. Although Spicer coordinated several briefings for the press during Trump’s trip overseas, many of them were “off camera,” frustrating cable executives looking to propagate the ongoing Russia narrative back at home. Despite the widespread gossip, Spicer returned from Trump’s foreign trip with an on-camera briefing at the White House press briefing on Tuesday, directly contrasting the stories about the future of his job. White House sources confirm for Breitbart News that Spicer will stick around in his job at the press office. Spicer took the podium on Monday praising Trump’s “incredible, historic trip” overseas and hammering “fake news” from news reporters. Ultimately, the best messenger is the president himself. He’s always proven that — that he is the best messenger not just for what he wants to articulate, but that the American people resoundingly chose him as their president because he understands the frustrations and concerns and values of the American people, and he is probably the best person to communicate that. Spicer is scheduled to lead an on-camera press briefing early Wednesday morning with Veterans Affairs Secretary David Shulkin and will host an off-camera briefing for reporters in the afternoon.